Made in the USA by you! Man, do I have a cool American made shoe for you! But guess what? It isn’t even made yet. That’s because you get to make it. Or more accurately, you get to design it and then the members of your extended American family working at New Balance get to make it for you. But you have to hurry, this option isn’t available forever. New Balance makes running shoes on the east coast. 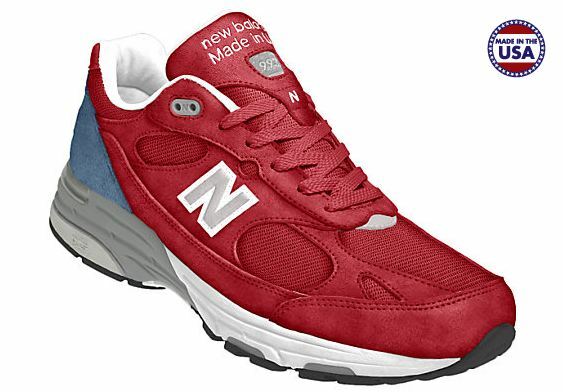 I got an email letting me know that for a limited time, you can completely customize a New Balance US 993 shoe. I think a red, white and blue motif would be stunning, but it is up to you. The design gallery shows 403 different versions of the 993 shoe, but don’t settle for someone else’s design, make your own. After you have designed your very own shoe, sit back and visualize a member of your extended American family taking all the steps necessary to build your shoe. And if you are crappy at visualization, you can watch a wonderful video of the whole process instead. Now get designing! Then shopping! This entry was posted in american made, Made in America, made in usa, shoes and tagged Footwear, New Balance, Shoe, Shopping. Bookmark the permalink. 1 Response to Made in the USA by you! Thank you New Balance for manufacturing in the USA!! We all can make a difference.